The Pacific War Online Encyclopedia: King, Edward P., Jr.
Table of Contents Next: King, Ernest J.
Edward King was born in Atlanta and graduated from the University of Georgia with a law degree in 1903. Commissioned a second lieutenant in the National Guard in 1908, he served in the Philippines in the years just prior to the American intervention in the First World War. He graduated from the Command and General Staff School in 1923 and the Army War College in 1930 before himself becoming an instructor at the Command and General Staff School. He subsequently graduated from the Navy War College (in 1937) before joining the staff of the Army War College. King was ordered to take command of Fort Stotsenberg on 14 September 1940 and was promoted to major general in 1941. 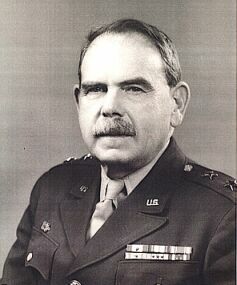 One of the army's best cannoniers, he served as MacArthur's artillery officer, but as war approached he was given command of North Luzon Force. After MacArthur escaped to Australia, King took over command of all forces in Bataan, where he was compelled to surrender to the Japanese on 9 April 1942. He retired soon after being released from a POW camp. Ken Stringer described him as "An intelligent, able officer, quiet, courteous, and modest."